No matter your goals, whether that’s bulk up or tone, strength training boosts your whole health and keeps your bones strong. Feeling the burn of that last curl inches from the last rep count empowers you. New to weightlifting? Start with lifting exercises that mimic everyday motions and focus on major muscle groups with these five tips. Start building your weightlifting routine around your major muscle groups. Some people work the lower body on one day and the upper body on another day, but you should target your major muscle groups. Focus on shoulders with raises and overhead presses, your chest with bench presses and your lower body with squats and leg presses. Online tutorials, machine instructions, attendants and fitness instructors can all show you how to target your muscles this way and use the machines properly. Don’t forget to breathe, and hold the pose temporarily for maximum benefits. New lifters may want to start with dumbbells which are more friendly than barbells and kettlebells. If the machines strain your jaw or back, supervised or guided free weight lifts may prove a better option. For chest presses, lie down on the bench with an even back, and hold dumbbells at a 90-degree angle from your chest in each hand. Palms should face away from you. Press the weights together and upward. Focus on pushing with your chest. Bring the weights down to the original position. That’s one rep. Try for five or ten more, depending on what you can handle. Then, try another exercise. When ready, work your way up to using kettlebells which are perfect for safely doing front squats and extension workouts as you get started. Kettlebells also help injured athletes who can’t squat with a bar. Don’t forget other options in the weight room, such as bands for stretching, warm up and main movements. Machines are a mixed bag because you move along a fixed plane which gives you balance and stability, but you may feel clueless about how to move your body. You also get less of a full body workout. You may feel tempted to rush into the gym and bench out more than three sets in a short stretch of time. Add that misinformed eagerness to being new to weightlifting, and you risk serious injury. Typically, there are ten reps in one set, and many try for three sets before moving on to a new machine or exercise. Take it slowly, and rest between each rep. Start with two sets and build up from there as your muscles gain strength and endurance. Most experts recommend lifting three times a week on average to build up your strength and endurance. You should do what feels right for your body. If you can only do one set and lift twice a week, that’s okay. Expect soreness, but also give your body a day between workouts to recover. Always warm up and cool down when you exercise because going right into it can cause injury or extra soreness that you shouldn’t have to deal with after a workout. Use yoga poses, like the chair pose or supported fish, to help you warm up and cool down. Transition in and out of each pose five to ten times instead of holding it to wake up your major muscle groups and increase flexibility more effectively. Yoga as a mindfulness practice helps you focus on the present and increase the benefits of your workout. It assists your body with preparing for and recovering from your exercise routine. Different poses exist for different experience levels and physical capabilities, too, so don’t be afraid to search for specifics to adapt to your needs. Along with warming up and cooling down, drink more water as you exercise and stay hydrated. Dehydration plus overexertion doesn’t do a body good. Weightlifting feels intimidating when you’re new to it, but don’t let nerves dissuade you. 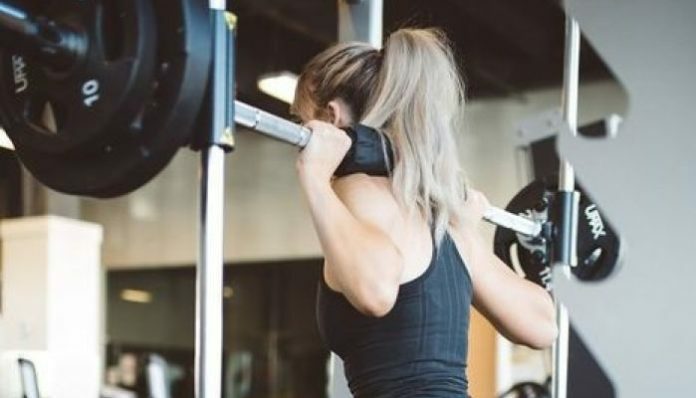 Forget nerves and instead, get buns of steel when you head to the gym! Start with dumbbells and a few light reps and sets to work your way up, and don’t forget to warm up, cool down and stay hydrated. You got this!